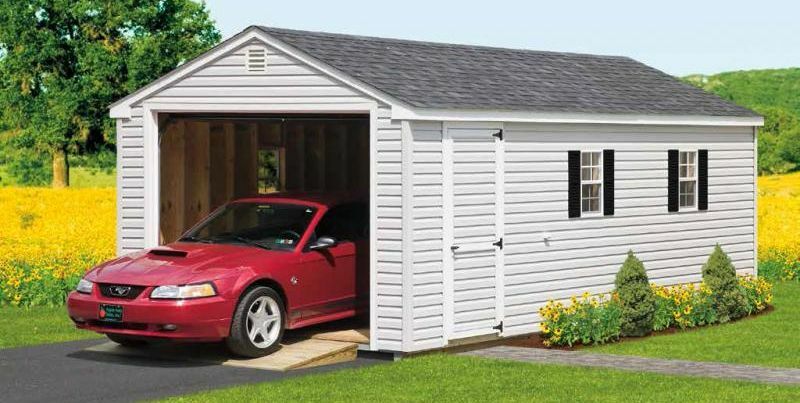 You can customize any of our detached garages to your liking, then we'll build and deliver it to your home. Want to store a boat or antique car. Protect their daily vehicle from and snow. Need extra storage for the lawn mower and yard tools. You can choose the color, material (wood or vinyl), shingle color and type, and more. Visit our Design Options page for more information. Our garages are available in 1- car or 2-car models with side doors for easy access. Some garage models have a loft with extra storage space. Garages come standard with 12-inch on center floor joists for extra strength, 9' x 7' or 8' x 6' 6" garage doors (with or without glass), 3-foot wide single door, and two windows with shutters. Sizes 10' x 12' up to 14' x 48'. If you have questions, please call us at 717-442-9320 or click the link to the right to get a free quote. Can Hold a Full-Size Truck. Great for a Lawn Mower! Extra Storage in the Loft! Add a Ramp for a Vehicle or Lawn Mower.